Our Holiday Collection features a complete set of our limited edition seasonal flavours, that are sure to warm hearts, and tantalize tastebuds. This makes for a perfect gift. Ginger Molasses – Direct trade, small farm, origin Honduras dark chocolate ganache, paired with house made ginger syrup, and fancy molasses. Milky Way – Direct trade, small farm, origin Nicaragua milk chocolate ganache, with brown butter, and brown sugar. Rum Baba – A seasonal favourite. Rum, raisin, paired with layered dark and white chocolate ganaches. Nog – Creamy white chocolate ganache infused with festive eggnog, rum, and cognac, and fresh grated nutmeg. Moon over Matagalpa – Direct trade, small farm, origin Nicaragua dark chocolate ganache, with a layer of caramelized chocolate. Pink Peppercran – A cranberry gelee rests upon a dark chocolate ganache infused with cranberries and pink peppercorns. The American cocktail of the pre-prohibition era was long considered as an aid to good appetite, digestion, and cheer. These potent potables were created to be savoured and enjoyed as much for their tastes as their effects. 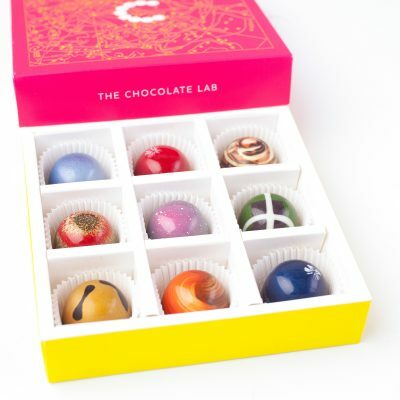 This collection of chocolate bonbons, crafted by The Chocolate Lab, represent an homage to nine classic pre-prohibition cocktails, using classic cocktail preparations inspired by the old 1935 Waldorf-Astoria bar book. 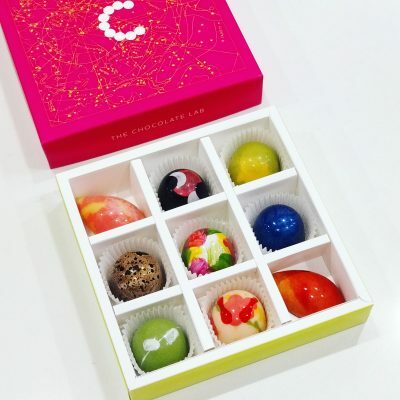 Each classic cocktail is expertly paired with high quality spirits, and unique origin fine flavour chocolate from different cacao producing regions. Hop-along – (Rum, Apricot Brandy, Lime Cordial) – Single origin Dominican Republic dark chocolate ganache paired with the Hop Toad cocktail. Mr. Santiago – (Cointreau, Rum) – Layers of white chocolate, and Origin Ecuador dark chocolate ganaches paired with the Santiago cocktail. Olde Fashioned – (Whiskey, Vermouth, Bitters, lemon zest) Single origin Peru dark chocolate, paired with a classic Old Fashioned cocktail. McKinley’s Delight – (Rye Whiskey, Vermouth, Kirschwasser, Absinthe) Our premium Or Noir milk chocolate paired with a McKinley cocktail . Oscar of the Waldorf – (Bourbon Whiskey, Absinthe) A blend of origin Peru dark chocolate and Ghana milk chocolate, paired with the Waldorf cocktail. A Rose by any other Name – (Rose infused Gin, Grand Marnier) Silky smooth white chocolate ganache infused with raspberry and rose, paired with the Rose cocktail. Pink Suburban – (Rye Whiskey, Port, Jamaican Rum) Origin Ecuador dark chocolate paired with the Suburban cocktail, with a lemon gelée. Matinee at the Bijou – (Grand Marnier, Vermouth) Origin Peru dark chocolate paired with the Bijou cocktail. Rob’s your Uncle – (Scotch Whiskey, Vermouth, Bitters) Our premium Or Noir milk chocolate paired with a Rob Roy cocktail. 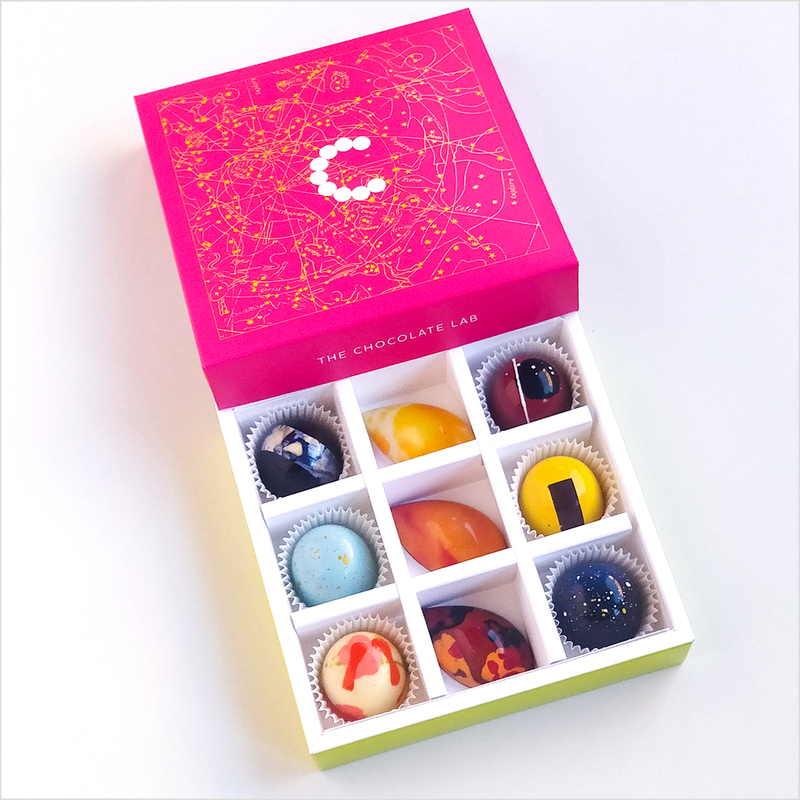 Be like an International Chocolate judge, and taste your way through our updated collection of Award Winning chocolate bonbons. Midnight Special -The Chocolate Lab’s own signature dark, in bonbon form. This premium dark chocolate was created in partnership with Cacao Barry, in the Or Noir laboratory, in France. An exquisite dark chocolate ganache. Orange Dreamsicle – Remember chasing the ice cream truck down the street for that creamy orangey goodness? This bonbon features a white chocolate ganache, infused with orange and cream. Olde Fashioned -Single origin Peru dark chocolate, paired with a classic Old Fashioned cocktail, inspired by the 1935 Waldorf-Astoria bar book. May Flowers -What April showers bring. Silky white chocolate is infused with a beautiful floral blend, including Jasmine and Hibiscus, and is topped with a peach compote. Shichimi -Japanese Shichimi Togarashi infused into our signature Cassonade milk chocolate, paired with a beautiful asian citrus blend. The King & I – Peanut butter and milk chocolate, layered with banana white chocolate. The King’s breakfast, in a bonbon. Strawberry Lemonade -An intense lemon gel layered on top of a strawberry and citrus infused white chocolate ganache. Pucker up! Dark Passion – An intense passionfruit gel is layered on top of a dark chocolate ganache that is infused with more passionfruit. Starry Night – A unique single origin 70% dark from Nicaragua is layered with sea salt and caramelized chocolate. 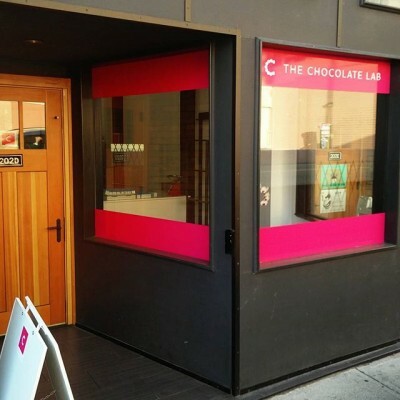 A deep and rich chocolate experience. Enjoy our spooktacular Halloween Skull box, for a limited time. Ghoulies and Cream – Chocolate caramel face, with cookies and cream head, cast in white chocolate. Red, Red spine – Raspberry caramel face, with raspberry and dark chocolate head, cast in dark chocolate. Bones and Brains – Vanilla bean caramel face, with PB and caramel crunch head, cast in milk chocolate. 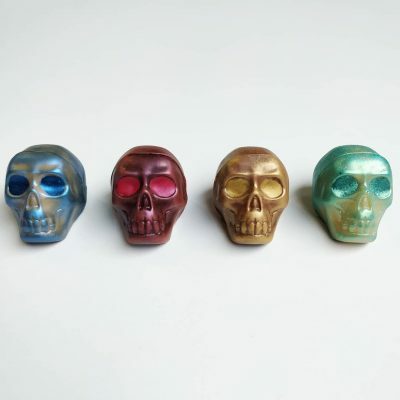 Skeletons in the Closet – Mango / Passionfruit caramel face, with lemon infused white chocolate and crisp head, cast in passionfruit chocolate. The top 9 flavours from our Summer #featureflavour series have returned for a limited time. Coco Maracuya – Dairy free. Coconut and Passionfruit. Almond Snap – Dairy free. Almond and sesame. Worms in Dirt – Milk Chocolate puddin’ with gummy worms. Tropical Paradise – All the tropical flavours. Breakfast Brew – Stout beer and single origin dark chocolate. The Vine – Wine reduction with concord balsamic and dark chocolate. Strawberry Lemonade – Tart lemons with tangy strawberries. 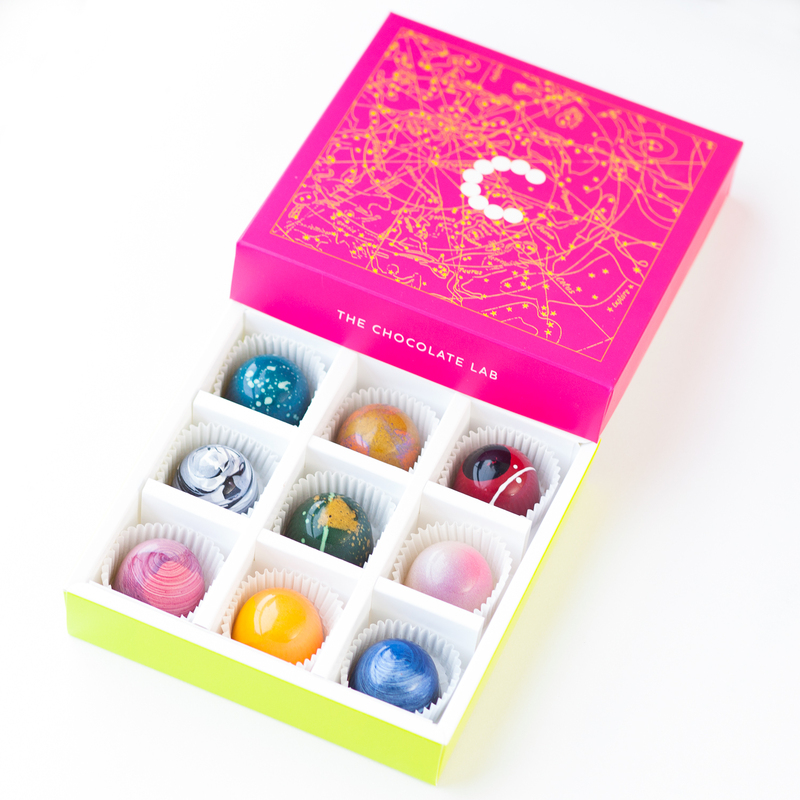 Shichimi – Japanese shichimi togarashi with milk chocolate and Asian citrus blend.